Where to have a good early dinner in Rome? I had booked my ticket for the prima (opening night) of Manon Lescaut at the Rome Opera House. Then I realized that the performance began at seven and would not end until ten. I am not a person for dining late, so my evening repast would have to begin at 5.30. This posed a real problem, for the Eternal City does not look kindly upon those who wish to dine before 7.30. Every restaurant I tried (and I tried many) would be closed. Then a happy thought occurred to me. I had a notion that within the impressive stone façade of the Hotel Majestic, which curves around a bend of the exclusive Via Veneto, was a well-regarded brasserie, which was open all day. I was right. I reserved a table at La Ninfa. I had sartorial problems, too. I like to wear black tie for the opera, particularly if it is a first night. But the forecast temperature was 80 degrees, and I became alarmed that the starched dress shirt and wing collar might make me wilt in the heat. At the last moment I substituted my lightest white suit, and hoped that, surrounded by Rome’s glitterati, I would not appear too outré. I need not have worried. I counted only three gentlemen in the audience in dinner jackets (of rather modest quality), and many of my fellow opera-goers were in jeans and open-necked shirts. Mercifully, the ladies put on a better show and some were very elegant indeed. A friendly gentleman in a white jacket appeared. This turned out to be the bar manager, Bettinelli Renzo. He looked after me very well – lifting the silver domes, recommending my wines and ensuring that I finished dinner with plenty of time for the short taxi ride to the Opera House. La Ninfa’s menu is short and to the point, which is as it should be for a place in which you can eat throughout the day. The style of cooking is similarly straightforward. I began with baked lobster, prettily presented, with a salad of string beans flavoured with almonds and black truffle. Then it was roast lamb with black pepper and an asparagus flan. This was the star of the meal, for the meat was wonderfully tasty. I ended with lemon tart, lemon sorbet and lemon cream, or ‘Three Ways of Enjoying Lemon’, as the menu had it – which I did, indeed, enjoy. These three courses were 64 euros. 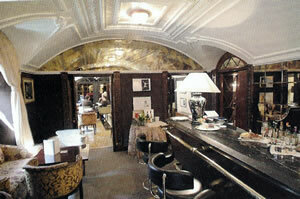 Drinking here need not be expensive, with many bottles on the list being in the 25-50 euros range. For those of you who like the super-Tuscans, the 2001 Tignanello is 120 euros and the 2002 Ornellaia and Sassicaia are both 210 euros. My white was a lightweight chardonnay (Puiatti, 2005 – 25 euros) and my red was a good, accessible chianti classico of ripe black fruit (Ducale Oro, 2003 – 42 euros). I do not think I can really recommend Manon Lescaut to you. Signor Puccini gives her an unconscionable time to die, and I fear that, by the time she drew her last breath, I was glad to be rid of her. But I will recommend this brasserie. The food, the surroundings and the service are all good. If you need an early dinner in Rome, La Ninfa is the place. 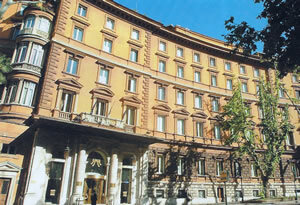 Hotel Majestic Roma, Via Vittorio Veneto 50, 00187 Rome, Italy.